All ACS Cooperative Show Reports shall be sent to ACS within seven days of the show using the form supplied electronically or downloaded from this page. Local Societies should furnish all the information requested on the ACS Show Reporting Form. 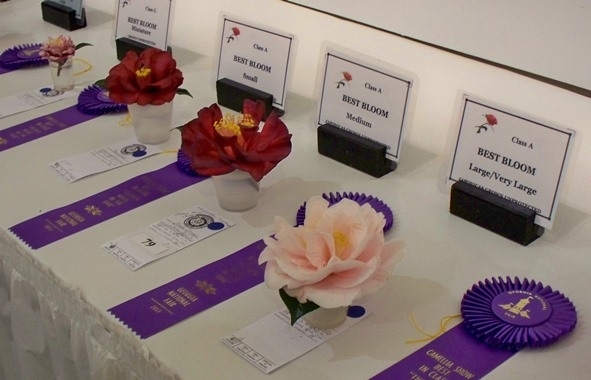 All American Camellia Society Cooperative Show Reports arer required to be sent to ACS within seven days of the show. The show chair and/or show contact person listed in the online show registration form will receive a show reporting form document customized with the show award classes listed in the Cooperative Show Schedule if submitted no less than a month prior to the show. Clubs which do not send show schedules will need to download one of the forms (both are MSWord documents) below and type in the award categories, winning blooms, and winning exhibitors. Save a copy of the emailed customized form to your computer's hard drive. Print a copy of the show report form and take it to the show. Neatly print the bloom names and winner names in the appropriate columns for each award class, number of attendees and exhibitors, list of participating judges, and the number of ACS Memberships recruited and sold at the required membership promotion table during the event. Send completed form as an email attachement to cbielby@americancamellias.org within seven days of the show. A blank (no award classes listed) form can also be downloaded according the the instructions below. Click the link listed under "Related Files" to open a Microsoft Word document compatible with your computer's version of Microsoft Word with a blank tabular template for reporting Cooperative Show Results. Click on the link, chose "Save As" to store the document on your computer's hard drive. Edit the document by typing the bloom names and winner names in the appropriate columns for each award class, number of attendees and exhibitors, list of participating judges, and the number of ACS Memberships recruited and sold at the required membership promotion table during the event. Leave any classes not included in your show blank, or delete the rows for those categories. Insert new rows as needed and add in any special classes or local awards to the bottom of the table. Then save the file and attach the document to an email message addressed to cbielby@americancamellias.org within seven days of the show.